In a large bowl, combine 2 cups of the flour and the yeast. In a medium mixing bowl, combine the warm water, mashed potato, the 1/3 cup melted butter, the sugar, and salt. Add potato mixture to flour mixture. Beat with an electric mixer on low speed for 30 seconds, scraping sides of bowl constantly. Beat on high speed for 3 minutes, scraping sides of bowl occasionally. Using a wooden spoon, stir in as much of the remaining flour as you can. Turn dough out onto a lightly floured surface. Knead in enough of the remaining flour to make a moderately soft dough that is smooth and elastic (3 to 5 minutes total). Place dough in a greased bowl, turning once to grease the surface. Cover; chill for at least 2 hours or up to 24 hours. Punch down dough. Turn out onto a lightly floured surface. Cover; let rest for 10 minutes. Meanwhile, grease a 13x9x2-inch baking pan. With lightly floured hands, shape dough into 15 rolls. Arrange rolls in prepared pan. Cover; let rise in warm place until nearly double in size (about 40 minutes). 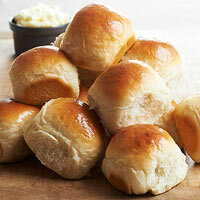 Preheat oven to 400 degrees F. Bake about 25 minutes or until rolls are golden and sound hollow when lightly tapped. Immediately remove from pan. Invert so tops are up. Brush tops with the 2 tablespoons melted butter. Serve warm.